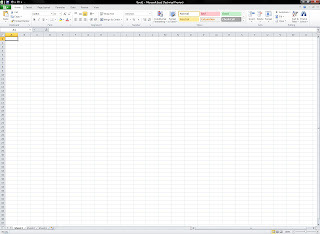 Some screenshots of Office 2010 have leaked out early. Leaks like this are normally a strictly geeks only affair (which is why I read the sorts of websites they get leaked on,) but when it's Office and we all spend half our working lives using it, I think the screenshots are worth a peek. I've also been looking at web design this week and what makes a site look good. The biggest thing that stands out about good design is minimalism. If something's on a page, then does it need to be? If it needs to be, then could it be simpler? It's an approach that Microsoft could learn from. Yes, Office 2010 has still got the menu ribbon. This doesn't just fail the minimalism test, it goes to the pub instead of revising, sleeps through its alarm clock and then misses the test altogether. It's huge! And isn't any easier to use for being huge. 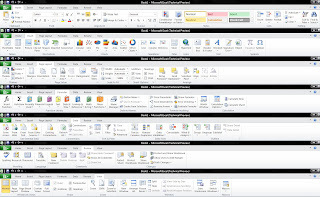 OK, so I'm at the technical end of Excel users, but 2007 (and now 2010) look like the menu was designed by Playmobil. It might be easier for your first five minutes with the software, but after that it's just really, really annoying. Traditional menus are far from perfect, but they're better than the ribbon. Any chance of Microsoft biting the bullet and admitting they've got this one very, very wrong? Answers on a postcard.